Cao studies the way that plant cells communicate with each other to ensure that plants develop appropriately and function optimally. He is interested in how these communication mechanisms evolved and how they can be altered to improve tomato plants and their resistance to stress. Some crops face greater environmental and biological stresses in future, his work is important in terms of food security. Dr Cao Xu’s lab research focus is on small peptide signaling and plant cell-to-cell communications, Cis-regulatory evolution and crop domestication. Cells must communicate over both short and long physiological ranges to ensure proper developmental patterning and functional connections. In plants, this can be achieved through phytohormones, mobile transcription factors, noncoding RNAs, and small signalling peptides. While the importance of small signalling peptides in cell-cell communication has long been recognized in animals, the primary focus in plants on nonpeptide, lipophillic phytohormones has overshadowed the importance of small signalling peptides. While several small signalling peptides have recently been characterised with vital roles in multiple biological processes, our understanding of plant small peptide signalling is still very limited (no more than 10% of plant small peptides signals have been functionally characterized) and hindered by many hurdles. Dr Xu’s lab is developing novel strategies to fully reveal the landscape and impact of plant peptide signals in cell-to-cell communications. Domestication of wild plant species into crops has provided human with food and nutrition. Cis-regulatory elements that control development and physiology by regulating gene expression are frequently selected during crop domestication, due to the lack of detrimental pleiotropic effects. 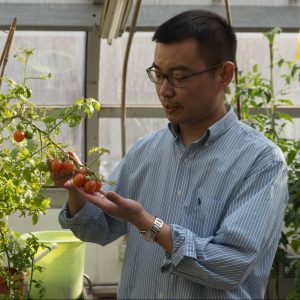 Dr Xu’s lab integrates genetics, genomics, and gene editing to explore cis-regulatory elements evolution and their relationship to plant development and stress resistance in tomato and related nightshades, aiming to accelerate or engineer crop domestication. Cao Xu joined CEPAMS in 2017 from the Cold Spring Harbor Laboratory. His influential work there on development in tomatoes was featured on the cover of Nature Genetics in 2015.